A memorial service was held at the Parish Church on Sunday [18 July 1915] for the late Lieut. 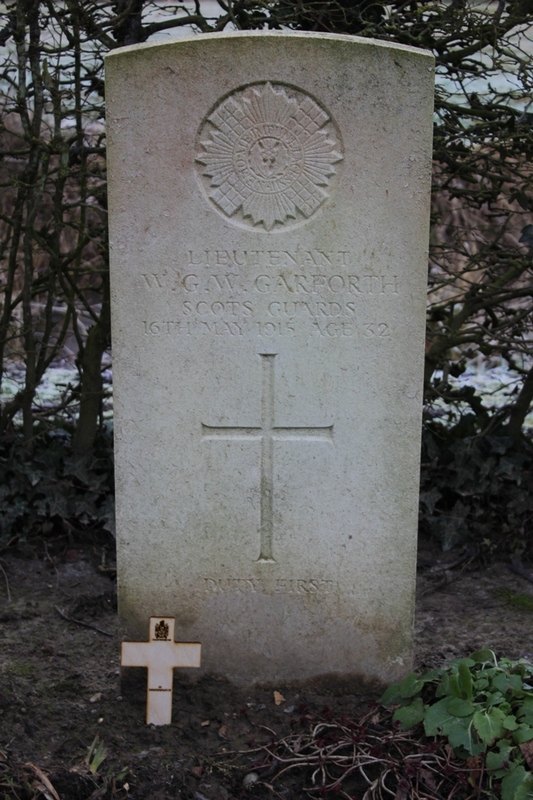 W. G. W. Garforth, who joined the Scots Guards in January, and was killed recently. Lieut. Garforth succeeded the late Mr Philip Hart as agent to Mr Leopold de Rothschild. The service was held in the afternoon, and the Church was full of friends and neighbours, assembled to honour his memory. Among the congregation were Victoria Countess Yarboro, Lady Edith Cotes, Dr W. and Mrs Square, Dr A. Chignell, Mrs and the Misses Tatham, Mrs Tarver, Mrs C. C. Edmunds; representatives from all the branches of the Ascott Estate; the Wing Detachment of the Volunteer Defence Corps, under Platoon Commanders J. Tarver, E. W. Robinson and A. S. Heley; the special constables, in which the deceased was a Lieutenant, the Boy Scouts under Scoutmaster W.J. Long. The pew which the late officer usually occupied was draped with the Union Jack and bore three laurel wreaths, inscribed – “In loving memory of W. G. W. Garforth, from his friends and colleagues at Ascott: Dulce et decorum est pro patria mori”, “In affectionate memory of a gallant soldier, from his friends at Wing”, “In memory of Lieut. W. G. W. Garforth, from his neighbours at Burcott: ‘To him who for his country dies, an entrance grant to Paradise, though dead to us, alive in Thee'”. At the commencement of the service the organist played “O, rest in the Lord”. Then Psalm xc was sung, and the hymn “Brief life is here our portion”. After an address by the Vicar (Rev. F. H. Tatham), the service ended with the new “Battle Hymn” by Canon Bouverie. William was the only son of William Henry Garforth and the Honourable Hylda Maria Madeline Willoughby (the daughter of Henry Willoughby, 8th Baron Middleton). He was born in Settrington, Yorkshire, on 10 February 1883 and in the 1891 census was with his family and maternal grandmother at Settrington House. He subsequently attended Charterhouse School in Godalming Surrey until the age of 18, while his parents lived in various villages around Malton in Yorkshire. 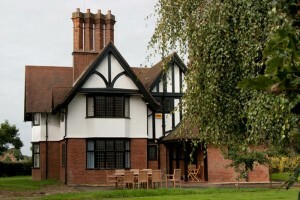 Charterhouse School was founded in 1611 and moved to its present premises in Godalming Surrey in 1872. William attended from 1898 to 1901. While his academic record was not good he had more success at cricket, representing his house Girdlestoneites from 1898 and playing for the school’s First XI in 1901. 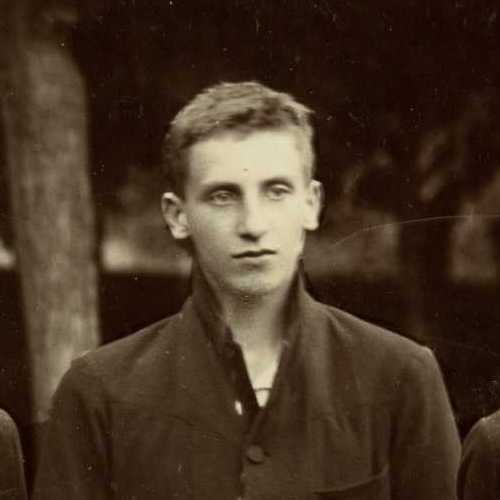 He is also mentioned in the school magazine The Carthusian as playing fives, rackets and football, and most pertinently for our purposes he achieved the rank of sergeant in the Charterhouse Rifle Corps (the equivalent of today’s Combined Cadet Force) in November 1900. All this fits the traditional profile of the former public schoolboy of this time from which WW1 officers were drawn – a heavy emphasis on team sports and athletic prowess, and an understanding of discipline, military drills and basic weapons handling. After leaving Charterhouse William attended Yorkshire Agricultural College (which became the University of Leeds in 1904). William came to Wing by June 1910 and was employed by Leopold de Rothschild of Ascott House as his land agent, working from the Estate Office and living in one of the Rothschild-owned houses in Burcott. His role would have meant he came into frequent contact with both the fellow landowners of Wing and the various tenants of the Rothschilds in his work capacity and it is clear from the funeral notice that he made an effort to participate in community groups as well. He was a batsman of “delightful form” (and also bowled a few opposing batsmen in his time) for the Wing XI and Ascott XI cricket teams from his arrival in 1910. 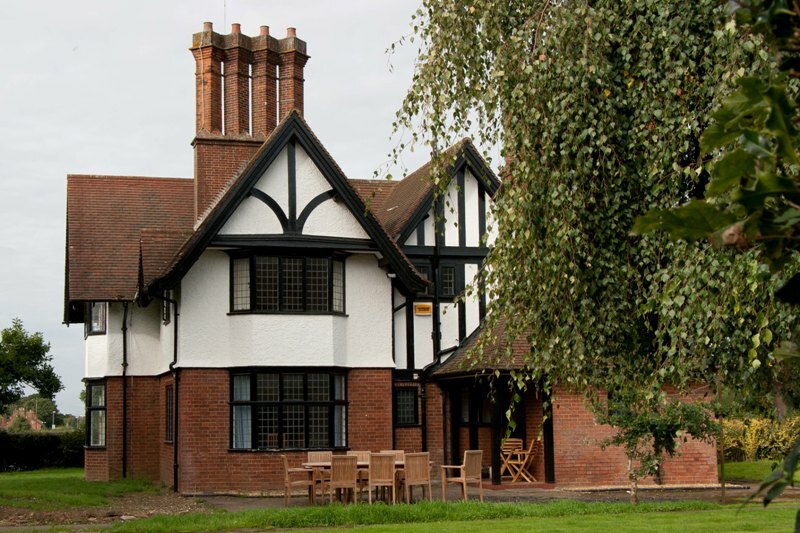 Ascott in particular hosted a number of visiting groups – in August 1910 the Bucks Herald staff had their annual outing to Ascott which involved a cricket match, tea and speeches with William speaking on behalf of Leopold de Rothschild who was away from home. William was also a committee member of the Bucks County Cricket Club. From his funeral notice we learn that William had been a special constable. This was a volunteer position assisting local police in heightened security once war broke out. It would appear William did this for the first few months of the war, then by early January 1915 he had enlisted in the Scots Guards. His public school background meant he obtained a commission as an officer, albeit a 2nd Lieutenant which was the lowest rung, in the 2nd Battalion. However there does appear to be some confusion over his rank – his appointment on probation as 2nd lieutenant appears in the London Gazette dated 9 January with his rank confirmed on 22 March, but a subsequent notice of promotion to lieutenant is dated 28 January and appeared in the Gazette edition on 10 June 1915. His medal card shows him as lieutenant with a correction to 2nd lieutenant, and he is consistently referred to as 2nd lieutenant when mentioned in the war diary of the battalion. William arrived in France on 28th February 1915 and joined his battalion in billets at Vieuxbergoin on 4 March. His first battle began on the 11th at Neuve Chappelle. The battalion lost 50 men during the first day and 100 the next, came under constant German shelling overnight, struggled in trenches waist-deep with water, put themselves unnecessarily in harm’s way after the orderlies carrying orders for withdrawal were killed en route, accepted the surrender of 300 Germans, and finally once they had withdrawn into billets had to be moved the next day due to shell fire. The rest of March consisted of a rotation of three days in trenches followed by three in billets, then in April there was plenty of marching and drill parades to attend. From 17th to 25th April “Captain Warner went on leave, his duties as adjutant [battalion administration] being taken over by 2nd L WGW Garforth”. Early May saw the officers being briefed several times on plans of attack which were subsequently cancelled. At 2.45am on 16th May the plans finally went ahead at Festubert. The Scots Guards were working together with two battalions of the Gordon Highlanders and a battalion of the Grenadier Guards. F Company, of which William was a part, was in the centre, and their first objective, the Orchard, was successfully taken. Unfortunately in the din and excitement things rapidly went pear-shaped after this and F Company found themselves under heavy machine fire and “completely cut off by this German counter attack. A subsequent visit to the ground being a testimony as to the gallant manner in which they fought, the German and Scots Gds dead being mingled together, and from appearances they must have fought the battle out there to the finish”. Apart from a few dozen men who had earlier managed to extricate themselves, the whole of F Company died. The book “A Private in the Guards” by Stephen Graham, published in 1919, sheds additional light on this by recounting the battalion’s stories leading up to the battle. A shell-shocked private (Isaac Reid) who went missing for a short time during the Battle of Neuve Chapelle had been court-martialled and executed on 9 April 1915. This allegation of cowardice mortified the men who swore in their next battle they would never surrender, no matter the cost. Unfortunately for F Company and William, they found themselves in a situation at Festubert where they did uphold that oath – they were subsequently known as the “Immortal Eighty”. William was initially noted as missing in the battalion’s war diary for 17 May, with a note that he is believed to be the unidentified 2nd Lieutenant of the Scots Guards buried with one of his fellow 2nd Lieutenants, and that the body would be exhumed to verify. 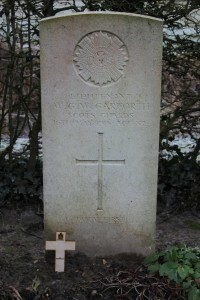 There is no further mention of this, however the records of Pont-Du-Hem Military Cemetery in La Gorgue indicate that he originally was an unidentified burial but was subsequently able to be identified using his clothing, boots and buttons (the same could not be said of the dozens of privates of his company who died with him and are still unidentified). William was 32. “Duty First” – William’s gravestone at Pont-Du-Hem, reproduced with the kind permission of the Headmaster and Governors of Charterhouse. As well as on the Wing War Memorial, William’s service is commemorated at Pont-Du-Hem, the WW1 memorial in Westow Yorkshire (see http://www.roll-of-honour.com/Yorkshire/Westow.html for a picture of this memorial which was unveiled by the Honourable Tatton Willoughby, William’s uncle), and in the Charterhouse School Memorial Chapel which was consecrated in 1927 as a memorial to the 687 Carthusians who died in WW1. Administration of his estate was granted to his father William, then a Major in the 3/5th West Yorkshire Regiment, and his effects were valued at £737 15s 8d, including £40 17s 6d listed in the Register of Officers Effects.